"Baby Mine", who was Res Grand Jr@ the 2010 State Fair freshened for her second time with a lovely mammary in 2012, Sadly we lost her in August of 2012. 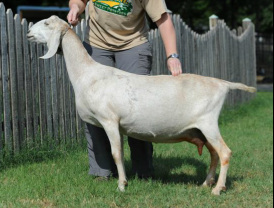 We still have a gorgeous AI doeling "Rock 'n' Roll Music" (Music) who joined the milk line in 2012. 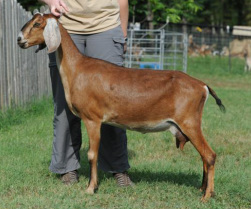 Lily is bred to Dexter for 2014 kids.